I want to get organized. I hear that over and over. Why is it that we all want to get organized, but nobody wants to declutter? You just can’t organize clutter! You can’t. It’s impossible. Quit arguing with me……and yourself. An organized and clutter-free home reduces stress and allows things to run more efficiently. In turn, you will have time for things like (I don’t know) cooking real food. Clutter can get out of control so easy. It happens to the best of us. Kids grow in a blink of the eye and soon their closets and drawers are full of clothing that no longer fits them. Stuff goes into junk drawers and never comes out. Nightstands become catchalls for who knows what. Our pantries are likely full of food that we don’t remember that we bought and has expired. Clutter is not a problem………until it becomes a problem. Running around the house looking for things like a crazy woman is never fun. I’ve done plenty of it! Where is that softball sock that I know I washed? Anybody see that permission slip for the field trip? Where the heck is that book I put in a special place so it wouldn’t get lost? Uggh! Why can’t I find anything? Nothing slows you down like disorganization. This month we are going to get some of your sanity back. Let’s start chipping away at the clutter. 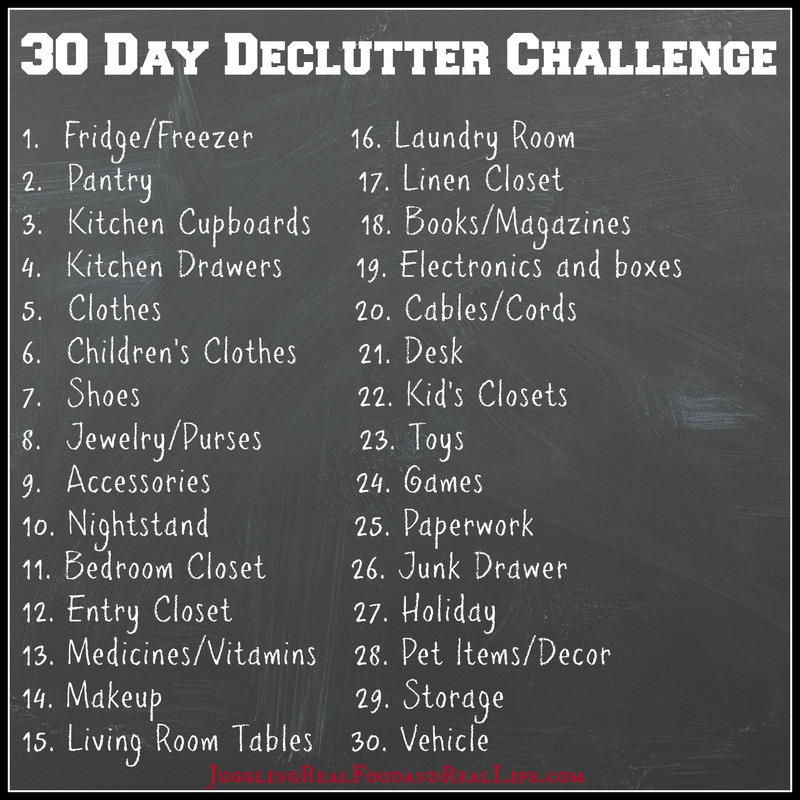 Your house did not get cluttered in 30 days so it probably won’t be completely decluttered in 30 days. Still, we can certainly put a dent in the clutter and get thing moving in the right direction. With each donated box, you will feel lighter and more able to cope with your busy family life. You can use the list above to get started or pick an area of your home that really annoys you and start there. Donate all of the items that you no longer need or love. Toss the trash! Then…………stand back and enjoy the freedom that a decluttered home brings. For more tips on decluttering check out Freedom From Clutter in 40 Days. There you will find information on where to donate your clutter and detailed information on decluttering items like cosmetics and medicines. I have been decluttering for about seven or eight months now. It has been long overdue. I do what I can each week and schedule for Easter Seals to pick up each month. I always have at least one box to donate and usually more. It feels good to get rid of things and then actually have places to put the things that I really need and love. I hope you join this 30 day challenge with me. Pick any 30 days. You don’t have to start the first of the month. Just start. What area of your home do you think has the most clutter? Why do you think you allow clutter to collect? What advice do you have to give others who are decluttering their home? Leave me a comment and let’s get the conversation going.